This is a variation of the Animals Rainbow sweater. Scotty dogs and bones in periwinkle line up on the rainbow front and rainbow back. Cats and cat faces are on the mirrored sleeves. The cats are adapted from The Tap-Dancing Lizard. The neck and peplum picot trim is alternating stripes of dark blue and rainbow. I like how the stripes clearly show the peplum decreases. The wrists ribbing trim is alternating stripes of dark blue and rainbow. This is a larger, more subtle, version of the Rosanna Butterfly sweater. The variegated red swirls repeat against a green background. In the center of the front is a butterfly pattern adapted from Alice Starmore. The back is just swirls. The neck, wrists and hem trim is green triangles on a pink background. The neck and wrists end with a simple picot trim. The peplum at the hem has three varying greens that end in a variegated green lace. Another variation of the Shield sweaters. Here the lion takes center stage. The front and the back are almost identical: a golden lion in a shield on a background of columns of red and dark blue. The sleeves have the columns of diamonds shown on the body of the sweater. 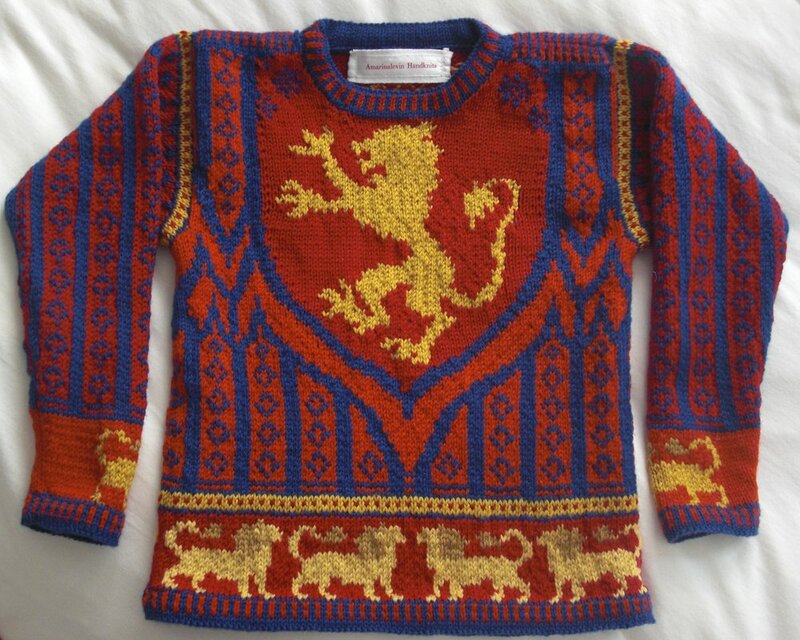 At the wrists and hem is a trim pattern of golden lions on red. The neck, wrists, and hem trim is alternating stripes of variegated red and dark blue. 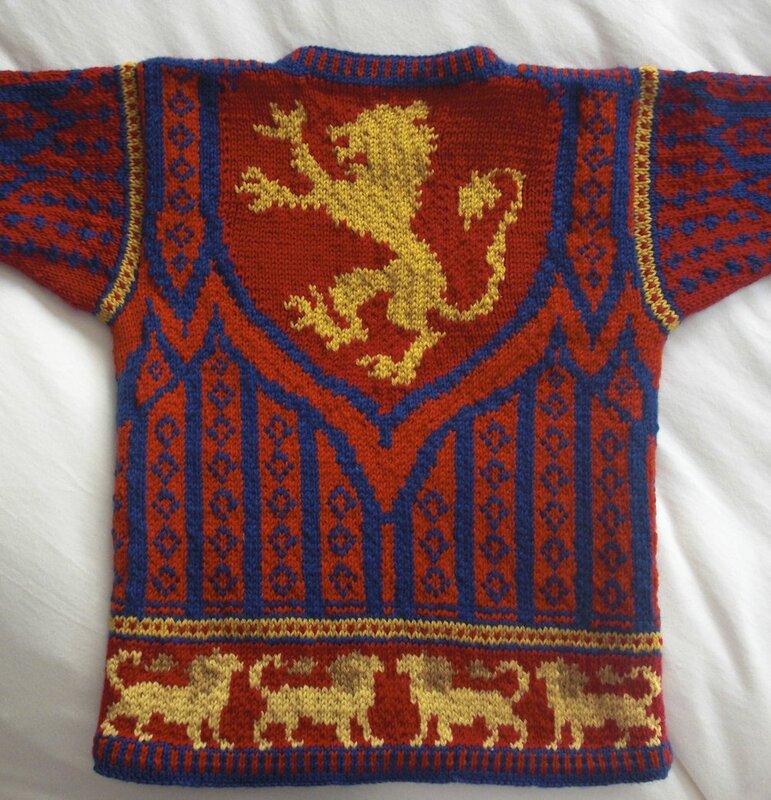 A larger version of the Norwegian Roses sweater. This is a colorful pattern of white snowflakes on dark blue. The inset is variegated red roses and green leaves on periwinkle. The sleeves are variations on the main pattern, with another inset of roses. The wrists and hem trim is dancers in white on dark blue. The neck, wrists, and hem have picot trim in alternating stripes of red and variegated blue. In knitting this, I am so relieved to get to the inset patterns for the variation. The snowflakes can feel endless to me. For some reason, this is one of my favorite sweaters! So of course, here again is periwinkle and white. The main image is of two Viking ships facing each other in the sea with a large four sided star design (adapted from Alice Starmore) above. The sky is filled with stars or snowflakes, whichever you prefer. The front and the back are the same. On the identical sleeves the design is similar, with one Viking ship and half a star. At the wrists and bottom is a design of Vikings wearing brown clothes and grey and white Viking helmets against a sky blue background. The neck, wrists, and hem are trimmed in dark blue and red stripes. Here the colors have been simplified, with varying blues. 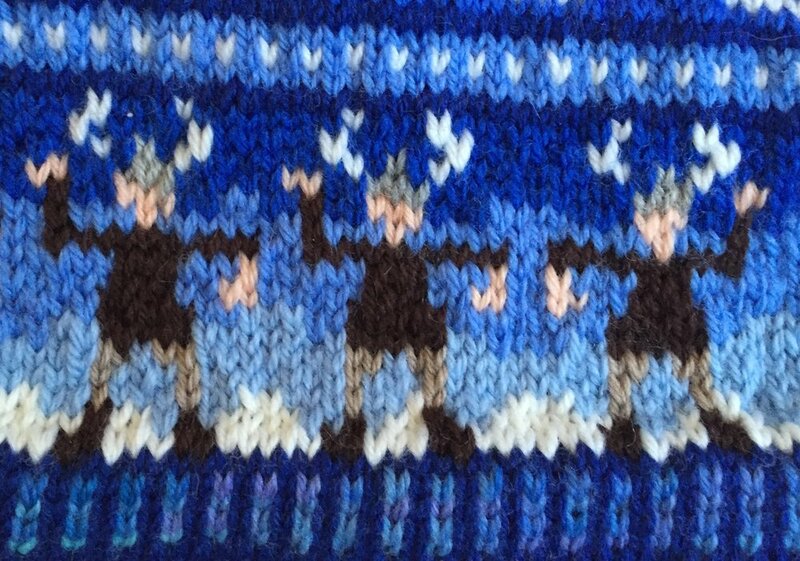 I've also done a version of the Viking hem with the Vikings in white and the background dark blue.